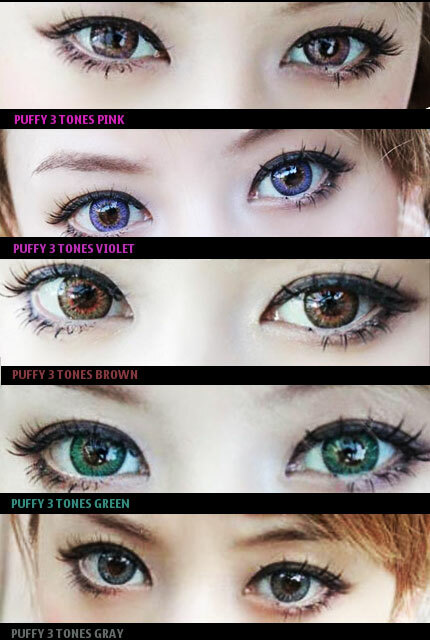 Puffy 3 Tones contact lenses comes in 6 shades of color distinguished in its design and 3 tones color. In concert recognizing contact lenses as one of the main highlights in fashion and design, Puffy 3 Tones contacts is designed in diameter 14.5 mm suitably designed for those who are sensitive to matching contemporary colors as part of the fashion and design. Puffy 3 Tones give u that big eye effect in spectacular and vivid way. With its new advanced material, Puffy 3 Tones give greater comfortability and eyes don;t get dry. Puffy 3 Tones lens is free from heterogeneous discoloration after wearing, so it continuously give comfort and you can naturally express your new image. The price quoted is for 2 bottles OR one pair and whenever you key in 1 (one) as quantity, that will mean you purchase 2 bottles or 1 pair. Should you require special order of 2 bottles of different powers, please address such request to sales@my-contactlens.com and we will try to accommodate your request the best we can.